I haven't written much on system trading lately. Mostly, because I've been wandering out in the deep jungle of quantitative finance and to be honest...got lost. I got so engrossed in theory that I forgot just what I was after. Luckily, I found an old creek that led me back to my entry point. A little weary but a little wiser and more appreciative of the systems I currently trade. What's really amazing is after 5+ years of developing systems and trading them...the very first one is the most successful. And the second one is the second most successful. And the third is the third...and so on...and so on. This reminds me of a programming conundrum that I run across all the time. When tackling a problem of how to program a certain piece of logic...my very first solution to the problem is always the best. And I don't know why. Because the solution I come up with isn't an "Aha!" moment. It's basically a thought that you "could" do it this way...but I'm sure there's a better way. And notoriously, there isn't. It's always that first split-second solution that is the most adept at cutting straight to the heart of the problem and getting the job done. Crazy, ain't it? Especially, if you're a logical type of person who believes the more thought applied to a problem, the better the solution will be. Wanna know what's crazier? There are programmers out there who do not have this type of split-second solution ability. Or...they do and don't honor it. Allowing themselves to stew on the problem too long. Thus, the corresponding logic and code is horrible. These "gifted" programmers have a name...The Innovators. And know what? Nobody wants to support or work on an Innovators code. Funny. XYZ stock closed at $30.00. ATR Trailing Stop := Close - (ATR * Multiplier) := $30.00 - ($4.00 * 3) := $18.00. 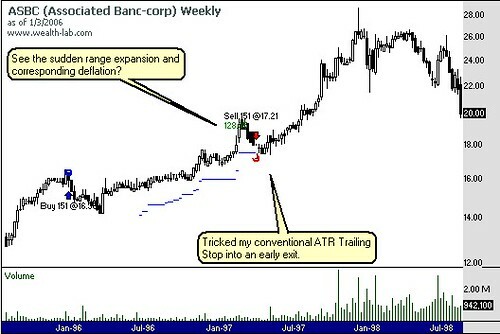 This ATR Trailing Stop would scale up...never down...as the price of the stock closed higher and higher or as the stock grows less volatile. And then, if the price were to close below the ATR trail...you'd exit your position. Get the picture? Now on to my system. The problem I've noticed after trading this system for a number of years is that investments (stocks) would exhibit very small ATR's for the majority of time but every so often experience a huge expansion of range for just one day taking the price many points higher. As a result, I'd get kicked out early in the long-term move because volatility would sink back down, price would sink back down, while those price spikes scaled me up on the trailing stop to a level that didn't fit with the overall move in the stock. Cause as I said before...we always scale our stops up...not down. ATR Trailing Stop := AverageClose - (ATR * Multiplier) := $27.00 - ($4.00 * 3) := $15.00. As you can see, we decreased our trail 17% from the original trail. This might not be the right thing to do in most trading systems. Since most systems are trying to capture range expansion in some shape or form. But, if you're one of the few long-term traders out there who try to capture long-term moves...expansion is not your friend. It will shake you out prematurely. Changing the calculations in your systems to moving averages instead of just one or two price points...may help keep you with the trend longer. 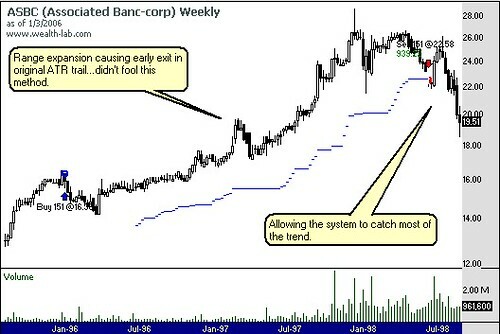 Note: Please check out the comments for further detail on the type of system being used in the ATR Trail example. I have to say I think that is an excellent idea. No problem if you don't want to reveal it, but I was curious if you use similar logic to place your trade entries. I trade mainly SAR-type models over long term...so I take the exit long as the entry short. Like I said, no big deal if you don't want to outline it. One filter for general market trend and a filter determining trend and strength of the individual stock. And finally 1 pattern I've found through modelling long-term charts based on stocks that move slowly and steadily higher and higher for months and years. I'll try to post charts of past trades from this system either today or tomorrow. Then have two exits: 1 disaster stop and 1 ATR trail. The ATR trail actually doesn't kick in until a set number of days thereby the need for a disaster stop. Hope this helps. Your SAR-type model sounds interesting. I have not worked much with SAR models on stocks...but have a couple in place for the indicies and have thought about their uses in trading the Profunds/Rydex long and inverse funds. I use a similar ATR to setup a stop, and if it goes through that stop, I reverse - it's been working well for me. I often filter the result with, say, a CCI parameter or a bow-tie (10-20-30ma) to confirm the trade in the alternative direction so I don't get shaken out too much. Obviously a lot of people are not comfortable going short so for those people, a trade entry is very important. I look forward to whatever you feel like sharing - I'm always refining my filters and interested in learning what others are using. And a disaster stop is a great idea - I haven't done that and really should. Do you normally put that at a hard percentage? Yes, I use a fixed percentage on the disaster stops. Typically 17% from entry. Why 17%? I have no idea. :) It just seems to be the percentage that works the best across most of the systems I develop...long-term ones that is. I also do not use hard stops nor exit positions intraday. My exits are always at the open or at the close. When the stock is falling like a knife...I find by waiting til the next day or next week (weekly systems) that my exit price is in most cases improved. So, in essence my disaster stop isn't my true disaster stop. I use my position sizing to keep me from the blow outs. Never size a position greater than a certain percentage of my account equity. One of my current frustrations is that I am unable to invest in individual equities at the moment - basically I can use ETFs and Mutual Funds - due to my current job. As a result, while it can be argued that I am diversified through ETFs like SPY and QQQQ, it does mean I have to overweight those positions relative to what I would normally do. So, I might have a 10% position in the Qs - way too big by standard measures but the only way to do it with ETFs.